According to a study by RAND Europe, the U.S. loses approximately 3% of its total GDP, or $411 billion of lost productivity, due to sleep deprivation. With an increasingly large audience of educated consumers, individuals and companies alike are continuing to explore the impacts of sleep quality through data collection and product innovation to find solutions that ensure a good nights sleep. The traditionally staid mattress industry has been undergoing a revolution of sorts, ignited in 2014 by the launch of Casper, an e-commerce mattress company. By 2017 the company garnered a pre-money valuation of $750 million during its $170 million Series C, led by the Target Corporation. Casper has since announced plans to go public in 2019. While Casper may have begun the e-commerce mattress model, several competitors have also emerged as market leaders in the mattress space including brands like Leesa, Purple and Tuft & Needle. With such minimal innovation in the mattress space, it’s no wonder that upstarts have tried to revolutionize the space. As of 2015, Simmons, Serta and Sealy held over 50% of the global mattress market. With consumers’ growing interest in quality sleep, the global mattress industry is expected to reach $43 billion by 2024, a CAGR of 6.5% from 2017. Although we are seeing a surge of innovation and growth in the space, there’s certainly a history of private equity investments in the mattress industry. Back in 2002, TA Associates and Friedman, Fleischer & Lowe acquired Tempur World, maker of the Tempur-Pedic foam mattresses, which at the time had $250 million in revenue. Tempur-Pedic went public the next year and by 2012, Tempur-Pedic had acquired Sealy, bringing the combined company valuation to $2.7 billion. Sealy’s own brush with PE began in 1997 with its acquisition by Bain Capital, followed by a buyout by KKR in 2003, before going public in 2004. Health & Wellness takes a comprehensive, integrated approach to overall wellbeing. As identified by CB Insights, the global wellness economy has grown to an astounding $3.7 trillion and has expanded beyond food, personal care products and exercise. Today’s consumers are increasingly aware not just of what the product or service can do for them but how that product and service has been developed and manufactured. According to Euromonitor, “Consumers are increasingly adopting a holistic approach where skin, body and mind are considered a single entity.” Buzzwords that we keep hearing around Health & Wellness are: environment, sustainability, trust, integrity, authenticity. As such, we are seeing the increasing incorporation of food and beverage trends into beauty and personal care categories at even faster rates. Transparency allows consumers to understand everything about a product throughout its supply chain. Today, transparency into products builds trust at a time when consumers are lacking in trust, especially regarding big brands. For millennials, and now Gen Z’ers, a connection with a brand is key to building that trust and the ease of uncovering information online helps build loyalty for them. While sustainability can refer to a number of factors, we define it as being environmentally friendly. Companies can reap huge benefits from marketing their sustainability efforts to consumers. According to Nielsen polls in 2015, 66% of consumers across the globe were willing to pay more for sustainable brands, a sizable increase from only 50% two years earlier. Meanwhile, a whopping 73% of millennials indicate their willingness to pay up for sustainable products. Today, 64% of U.S. households buy sustainable products, an increase of four percentage points in only the past year. Have Americans become more comfortable talking about their gut issues? It certainly seems that way with the growing appetite for probiotic foods, beverages and supplements in general and more specifically, fermented foods. Probiotics are a type of functional food – foods that have shown health benefits – that contain beneficial live microorganisms, such as bacteria or yeast. While yogurt has been a mainstay in the U.S. diet for decades, only recently have a variety of foods and drinks with probiotics exploded in the market. According to Packaged Facts, 25% of adults in the U.S. actively seek out foods and beverages with probiotics or prebiotics. As consumers continue on their health and wellness quest and see more “food as medicine,” interest in fermented foods has grown rapidly, despite these foods’ strong tastes and smells. Fermentation was used by many cultures around the globe as a way to preserve food but hasn’t been prevalent in American diets until recently. Kombucha has led the way to other fermented foods and beverages in the U.S., driven primarily by millennial interest and a focus on healthier beverages with less sugar. Kombucha is made from fermented and sweetened tea and naturally contains alcohol due to the fermentation process. Originating in China, kombucha really took off in the U.S. after being pulled from shelves in 2010 due to the identification of elevated alcohol levels. Since then, many producers have sought to reduce the alcohol content to stay on grocers’ shelves and others, in contrast, have actively marketed the beverage as containing alcohol (branding it as kombucha beer). Kombucha has historically come in bottles at retail but can now be found more readily in kegs and 12 ounce cans. According to Statista, U.S. retail sales of kombucha are expected grow to $1.2B in 2020, from less than $400MM in 2014. With the new year comes the multitude of resolutions to be healthier and fitter. Experts and consumers alike are constantly redefining what this means and how best to accomplish it. According to the ACSM’s (American College of Sports Medicine) Worldwide Survey of Fitness Trends for 2018, the re-emergence of group exercise workouts is a key trend this year. Consumers enjoy the camaraderie of working out with others and benefit from the accountability that results from committing to a group and class time. Providers are constantly creating new and different concepts to appeal to fitness enthusiasts, unmotivated exercisers and newcomers. The ACSM expects that boxing and kickboxing studios will proliferate in 2018, along with time-efficient workouts. In 2016, there were over 35,000 membership-based exercise facilities in the U.S. The top 5 fitness and health clubs accounted for less than 20% of the U.S. market, with no player having a market share greater than 5%. The proliferation of new and unique fitness studios enables consumers to choose exactly how they want to work out – whether focusing on one specific exercise type or mixing it up and participating in classes at several studios every week. The popularity of ClassPass underscores this phenomenon. ClassPass provides all-access membership to over 8,000 studios worldwide without committing to high monthly fees at an individual location. In 2017, ClassPass raised a $70M Series C led by Temasek, along with current investors including GV and General Catalyst. As the population ages, the current generation of older adults recognizes the need to maintain an active lifestyle. Clubs are implementing tactics to attract this population, such as lower music or better lighting during traditionally slower times (i.e., mid-day) or programs tailored for older adults. The beauty landscape is quickly shifting, as consumers across numerous demographics are increasingly focusing on “self-care.” Consumers are not only changing where they purchase products, but also the basis for their decision-making process and how much they are willing to pay for products and services. At the core of many beauty product consumers’ behavioral shifts are the devices and digital platforms that provide health-tracking capabilities and help lift the veil for consumers on the inputs/ingredients behind the products they purchase. Social influencers are also having an impact on how consumers are making purchasing decisions. They are not only driving customers to certain brands and new products, but are even developing their own lines and using customer feedback to generate new ideas and fine-tune existing products. Despite higher prices in most cases, beauty product consumers are favoring brands and products that prioritize customer experience, unique ingredients/formulations and environmental consciousness. Large brands are using acquisitions to launch themselves into premium spaces. In November 2017, Unilever announced its acquisition of Sundial Brands to add to its portfolio of “purpose-led” companies. Unilever said in press release that the acquisition is “part of a broader Company transformation” aimed at community impact. As part of the agreement, Unilever and Sundial are creating a $50-100 million investment fund to empower women of color entrepreneurs. According to a Frost & Sullivan study in 2016, the $10.1B nutraceutical ingredient sub-segment lends interesting insight into what is most important to consumers. Combining to represent nearly 20% of the space, four categories stand out to us as the most attractive for investment: Cognitive Health, Cardiovascular Health, Eye Health, and Digestive Health. These four areas are not necessarily the highest growth sub-segments, but they have the highest “Expected Ease of Premiumization.” In other words, there is more room for formulators to differentiate their products by adding premium ingredients or innovation. Perhaps not coincidentally, these are areas of clearly defined impact relative to others (i.e., general wellness, weight management, etc.). We aren’t speaking to quality of life with this conclusion, but rather reduction of overall healthcare costs. According to the American Health Association, the expected cost of cardiovascular disease in the U.S. was $876B in 2015, but is expected to nearly double to $1.6T by 2030, which amounts to a 4.4% CAGR. It’s possible that the 6% expected CAGR through 2020 in the ingredient market represents consumers trying to outpace expected health issues in the future. As you have probably observed from prior issues of this report, we are of the opinion that to form a coherent view on Health & Wellness is to watch the consumer. In the past, we have explored how consumers spend their money, but this quarter, we have focused on how consumers spend their time. The Wall Street Journal has prepared a fascinating infographical dashboard summarizing data from the American Time Use Survey. While we are too new to some of this analysis to draw conclusions, we think there are some hypotheses worth sharing with you. Healthy Living is now a proper noun and it has pervaded every consumer category. In previous issues, we have written about people wearing athleisure apparel to work and drinking energy drinks when they are just relaxing at home. Now, in Q1, we are focusing on secular trends that we find notable and that will likely drive M&A in the coming year. Yes, we know you rolled your eyes when you saw that headline. “Fanbase” has become the CPG equivalent to tech words like “disruptive” and “tech-enabled.” However, Healthy Living, if defined as a consumer’s methodology for taking care of oneself, is not an industry; it’s a literary genre. The two most popular industries on YouTube, Beauty and Fitness, combined for over 220 billion views in 2016, or 31 videos per person on earth last year, according to a Pixability Study on digital presence in beauty. We think of ourselves as physically active individuals, but it’s hard to clearly identify the term’s underpinning. Is “health and wellness” a utility-based movement, where consumers seek products and services to make themselves healthier or better performers? Maybe health and wellness is something that people enjoy, or even use to form their identity, and the evidence lies in what people do outside of the sports or exercise occasion. While we do not have easy answers to these questions, we are watching some interesting things. What if we told you that people wear sportswear and shoes when they hang out at home three times as often as when they play team sports? You probably wouldn’t be that surprised, because far more people wear sports attire than play team sports. What if we told you that the ratio of those casual occasions to working out was nearly 1:1? That might be a bit surprising. It’s true. People love gear, and there are usage occasions for sports and exercise-related products outside of sports and exercise. We are starting to wonder if we’ll see this same trend appear in other areas. Do people just wear exercise apparel because it’s more comfortable, or because it’s a way to express their identity? We think it’s the latter, and we think that products and brands are blurring the lines between healthy eating, supplementation, activity and everyday life. Hold on, before the next topic we have to adjust our spandex. ENERGY DRINKS: WHAT IN THE WORLD IS GOING ON IN THIS CATEGORY? The consumer mindset is changing. 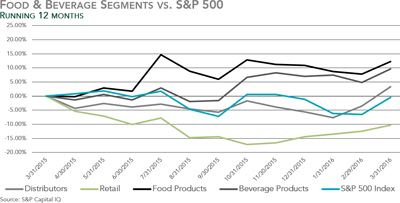 While the food and beverage space is experiencing the most pronounced overhaul, other categories are not far behind. People increasingly are mindful of the health implications of the products and services that they consume. The 2015 Nielsen Health & Wellness Survey pointed out that nearly half of global consumers are trying to lose weight, while nearly 75% plan to change their diets in the next year and 72% plan to prioritize exercise. Likewise, nearly 25% of North American consumers are willing to pay premiums for non-GMO and organic food. Perhaps most intriguing of all trends is that Millennials and Generation Z (which collectively represent all consumers under age 34) not only rate highest in terms of valuing health attributes in products, but they are comparatively the most willing to pay premiums for them. It’s no surprise that the innovation in most categories has moved toward consumer experiences that tend toward simplicity, authenticity and activity. Some of the fastest growing categories in non-durable goods are vitamins, herbs, sports supplements and healthy aging. We expect to see continued activity in areas that provide consumers with an avenue to experience enjoyable products within this realm. Categories to watch for in Q4 2016 are vitamins, minerals and supplements (VMS), beauty and personal care and outdoor lifestyle products. The Health & Wellness sector of consumer products was once an afterthought, a niche within categories that were only addressed by specialty retailers and distributors, and small brands impassioned by the pursuit of visions despite the misalignment between lifestyle and profit. Today, these visions have become viable businesses. In apparel, we are watching astronomical growth in the Activewear category, where female consumers have found empowerment by blending their active lifestyles with their everyday choices in what to wear. An entire generation of consumers has deconstructed and reconstructed its identity and value set to express its lifestyle. Similar things are taking place in other areas of consumer products. What was once termed the “leisure category” now shares a common thread with healthy and active lifestyle brands. Brands ranging from Lululemon Athletica to Callaway allow consumers to express their values and passions outside the environs of their favorite activities. Two factors are driving M&A and private placement activity in 2016: (1) consumers want to be healthy, but increasingly they are shifting trust to healthcare resources that they can access on their own, versus the healthcare system (see the chart below to the right); and (2) consumers want to express their lifestyles of health and wellness through the products they purchase. As the average age for the U.S. population continues to increase, opportunity rises for companies in the Health & Wellness industry that can address rising consumer demand to combat the effects of aging and to maximize overall health. Dietary consciousness is a leading trend for aging consumers as sales for digestive and anti-aging supplements have risen, specifically products produced with natural and organic ingredients. GNC attributes recent increases in customer acquisitions to its emphasis on plant-based proteins and probiotics. Acquisition efforts also are heating up for nutrition companies that have established strong brand recognition, consumer data analytics and niche products. In February, WellNext, LLC announced its acquisition of Stop Aging Now, a leader within the direct-to-consumer nutraceuticals market. “Stop Aging Now enables us to improve our service through digital channels while offering hundreds of the very best products to our customers,” said Ojesh Bhalla, chief commercial officer of WellNext. With growing demand and a vast array of available product brands, SDR expects acquisition activity to continue through 2016. 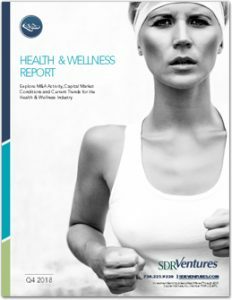 The Health & Wellness industry as a whole recognized significant secular growth in Q1 2016, which was primarily driven by Active Lifestyle apparel and devices. Operators have recognized that athletic clothing is being worn for much more than exercise, specifically among women. Consumers are trending toward spending their growing disposable income on affordable athletic wear for everyday use. Kate Spade New York and Beyond Yoga geared up this January to launch a co-lab collection around “Ath-leisure.” Industry titans Nike and Under Armour also recognize the opportunity and have launched ad campaigns targeting women. Additionally, Nike launched its first women’s exclusive retail store and Under Armour announced its Health Box, which includes a heart rate monitor, fitness band and smart scale, in addition to its newly introduced smart shoe and two different sweat-resistant wireless headphones. A major argument that suggests athleisure is here to stay is the growing and complementing “social fitness” trend where users on social media post about workouts, meal preparation and active lifestyle, motivating followers to structure their lives around living healthily and exercising often. Beyond devices, attire and supplements, consumers are more aware of what ingredients and additives go into the food they eat. Because of the desire to minimize processing, the role of food science is being reframed to embrace the spirit of natural products while addressing societal concerns. Consumers are making purchase decisions to avoid artificial sweeteners, preservatives, colors, flavors, MSG, genetically modified ingredients and unidentifiable chemicals. In response, High Pressure Processing (HPP) is becoming a more common nutrient-friendly, less-processed alternative to high heat pasteurization. Benefits of HPP include food nutrient and flavor retention and no added chemicals. This natural trend, also known as “Green Chemistry,” is playing a big role for operators producing health & wellness products. Despite the proliferation of healthy living as a mainstream trend with an emphasis on exercise and clean eating, obesity rates continue to rise in the U.S. In response, overweight consumers are transitioning their lives and attempting to lose weight, which has contributed to a global wellness market that reached $3.4 trillion in 2015 according to the Global Wellness Institute. For operators in the industry competing for market share, simplicity and convenience are key. Large nutrition retailers such as GNC (NYSE:GNC) and The Vitamin Shoppe (NYSE:VSI) have reported that their fastest-growing categories include ready-to-drink/eat products. Fitness facilities with numerous locations and month-to-month plans that cater to this demand for convenience are riding this trend and increasing memberships. For example, Planet Fitness (NYSE: PLNT) added over 200 locations in 2015 and reached nearly 4.5 million members nationwide. 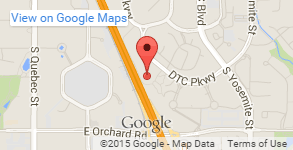 Planet Fitness is expecting to open 500 more locations over the next three years. As a whole, the growth in saleable fitness concepts is generating significant private equity group interest. Catterton Partners, for example, recently invested $75 million of growth capital in Peloton and acquired Pure Barre earlier this year, with the expectation that the popularity of scalable fitness concepts will continue to rise. Food companies have taken note of the “free-from” movement, where consumers are trending toward recognizable ingredients and avoiding certain ones such as high-fructose corn syrup, gluten and GMO. Natural Products Insider stated in September that 17% of American adults had used probiotics that month, a significant boost considering only 9% were even aware of the term in 2002. Larger players such as Hain Celestial see value in solid branding amongst smaller natural food companies. Hain, which has over $2.7 billion in annual revenue, acquired Ella’s, Greek Gods, Avalon Organics, JASON and Rudi, all of which had less than $30 million of annual revenue. The Vitamin Minerals and Supplement (VMS) segment is now $37-billion strong, and has grown at 5.5% per year since 2000. Companies servicing this enormous segment, such as co-packers and contract manufacturers, are attractive to acquirers, as evidenced by Swander Pace Capital’s acquisition of Captek Softgel International, a supplier of soft-gels for vitamins, minerals and supplements. Consumers of home personal care products are also seeking natural and ethically sourced ingredients, which are more commonly found in prestige brands. Estée Lauder claims the millennial consumer is willing to spend more of his or her disposable income on luxury goods than other generations and therefore it will be focusing acquisition efforts on prestige brands. Private equity has also picked up on this trend, as shown by Alliance Consumer Growth’s acquisition of NUDESTIX and Encore Consumer Capital’s acquisition of LORAC. As a whole, the consumer market is transitioning to a healthier and more environmentally conscious mindset. 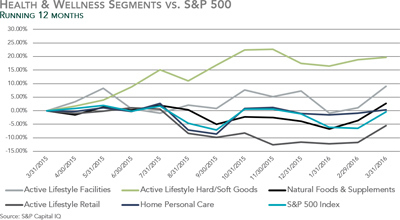 The Health & Wellness Industry outperformed the S&P 500 in the third quarter, which was primarily driven by the Sporting Goods and Leisure Facilities segments. Larger players are continuing consolidation efforts as demand continues to grow with increasing health consciousness in US. Additionally, average 2015 disposable income is increasing. Combining these trends points to a population that is expected to live longer and allocate a higher percent of disposable income for lifestyle products in areas including sporting goods, beauty-care products and leisure activities. Aggregate demand drivers of the segments are based upon a population that desires to live a more healthy and active lifestyle. In efforts to promote health and lower employee costs, firms also have been investing in corporate wellness programs which should drive growth in active lifestyle products and possibly continue the emergence of fitness trends that drive measurable results, such as Orange Theory and Soul Cycle. With market optimism for nutrition and supplements and a highly fragmented market, M&A activity is increasing with expectations to continue. Strategic buyers are a large driver as they look to expand their product lines. Financial plays have been predominantly roll ups of smaller firms offering unique natural products. Focused in particular on “ready-to-drink” protein beverages, powders, bars and snacks that are sold through multiple channels, M&A will likely continue to feature products that combine taste with natural, healthy and convenient themes. Companies that have demonstrated strong ROI in category marketing and trade spending will continue to attract interest from acquirers. The Health & Wellness industry represents a multi-billion-dollar market that continues to show signs of growth. This sector grew 6.11% during Q2 2015. The well-documented demand drivers that are contributing to continued growth include an aging population with a rising median life expectancy of 78 years and an increase in disposable income. The average 2015 disposable income is expected to rise 3%, to $38,551, compared to $37,410 in 2014. Additionally, a growing number of consumers have greater access to related education and are living more health consciously. Combining these trends presents a population that is expected to live longer and pay more for lifestyle products in areas including: Sporting Goods, Beauty Care Products and Leisure Activities. Demand for products and services in the Health & Wellness sector is expected to increase at a compound annual growth rate (CAGR) of approximately 9.4% through 2018. Key drivers over this period will include: rising healthcare costs, increased investment in corporate wellness and an increase in chronic medical conditions (Source: Harris Williams). In response to the sharp increase in healthcare costs, the Corporate Wellness Service industry has seen strong growth in the past five years. This growth is attributable to employers purchasing wellness-based programs in an effort to help lower overall healthcare costs for employees. Aggregate drivers of industry growth are based upon a population that desires to live a more healthy and active lifestyle. As America’s health-conscious population continues to expand and average life expectancy approaches 80 years of age, the health and wellness industry is well positioned for growth in 2015 and beyond. The International Food Information Council Foundation (IFICF) estimates that around 67% of consumers now look at a product’s nutrition label before making a purchase. Firms across the U.S. are implementing work-based health programs in order to maintain a healthy and productive workforce as an unprecedented number of older adults are continuing their careers beyond traditional retirement ages. The industry is heavily dependent upon rising disposable income and decreasing unemployment to drive its natural revenue growth, and innovation and product reformation will differentiate industry leaders going forward. Significant growth opportunities throughout the health and wellness industry lie within the expanding female population, budding emerging markets, and the advent of product personalization. The female population controls about 83% of consumer spending in the U.S. Women over the age of 50 are the healthiest and most active generation and account for nearly 75% of U.S. financial wealth among women. Industry growth in emerging markets has outpaced that of developed markets and will account for approximately half of global health and wellness sales by 2019. As consumers become more knowledgeable and discerning, they will demand products with a much higher degree of personalization which will require markedly higher investments from industry players. 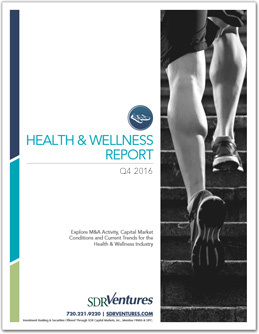 The health and wellness industry remained stable in Q4 2014 since improving in Q3. America’s popular healthy lifestyle trend has greatly benefited new and niche companies in this industry and offered economic rejuvenation for the declining leisure hard goods sector. Growing participation in sports (at 0.9% annually) and increased government investment in school athletic programs have supported sporting goods stores and manufacturers this quarter. Many sporting companies have focused on expanding their online sales activity in order to better target the growing adolescent market. An increasingly active baby boomer generation, rising per capita disposable income, and health trends have also sparked renewed growth in the gyms and workout facilities sector. Niche workout facilities and equipment have found ample growth throughout 2014, as revealed in the $10 million investment in internet-connected indoor cycling retailer Peloton Interactive. The vitamin and supplement sector continues to drop overall at the close of the year, with large players Nu Skin, Avon, and Herbalife facing major stock price dips. This could largely be tied to a decline in the multi-level marketing channel overall, however, as online vitamin retailers witnessed 13.9% growth in 2014 and are receiving high market valuations, as evidenced by the segment’s average public valuation of 10.1x TEV/EBITDA. Beauty Care sector performance plateaued after a 6-month decline in Q4 due to slow economic recovery, product innovation, and market expansion. Industry leaders continue to seek consolidation in order to expand their product offerings and reach the growing teen and male markets. Although growing low-cost imports have hurt domestic manufacturers throughout the industry, economic recovery and global consumer trends offer opportunities for growth in the upcoming year. 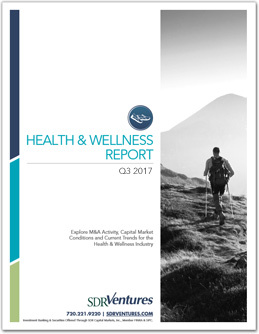 Despite the record level of M&A activity witnessed in the first half of 2014, the third quarter witnessed a drop in health and wellness transactions. The Leisure Facilities sector continues to lead the Health and Wellness industry in terms of number of transactions and can expect continued growth as consumer involvement in personal health and participation of women in physical fitness activities continue to rise. The acquisition of golf facilities and specialty workout facilities were also high in the Leisure Facilities sector this quarter. Despite overall slowdown in the health and wellness industry in the third quarter in transactions and stock prices, two areas of expected future growth are Vitamins/Nutritional Supplements and Beauty Care Products. In Beauty Care Products, a consumer-led trend towards multi-benefit products and luxury goods at home will promote increased M&A activities as new and existing players seek to expand their product offerings in these areas. Additionally, an aging US population and recent healthcare legislation* should promote increased profits across all health and wellness sectors. Although the number of transactions in Q3 2014 decreased, capital seems to be attracted to the health & wellness industry, as witnessed in the massive acquisitions of Elizabeth Arden and Dollar Shave Club. The first half of 2014 M&A nearly set a record in terms of deal activity, as almost every facet of the category saw transactions. 24 Hour Fitness led the charge with the largest deal of the quarter; but there were also four large nutritional supplement manufacturing deals (Twinlab, Nutri-Force, Cytosport, and Betancourt Nutrition); several deals in natural personal products, and even considerable activity in the country club, golf course, and leisure facility spaces. 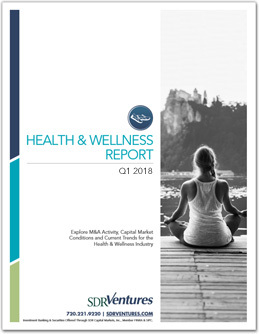 Despite an expected slowdown in disposable income and consumer spending for the second half of 2014, capital seems to be attracted to the health & wellness industry in the middle market. The demographics are favorable too; with a large chunk of the population aging, and health insurance carriers providing incentives for payors to lead healthy, active lifestyles, all things nutrition and health are becoming staples in the consumer basket. With healthcare costs rising both in drugs and services, look for continued M&A activity in natural products, nutritional supplements, and exercise methods and facilities, as “smart capital” becomes more and more inclined to fund this category’s growth. If you’d like to receive our next Health and Wellness Industry Report by email, please click here and select “Health & Wellness Report” from the list.